Often when ministers in the “word of faith” movement begin a sermon by saying, “I’m going to teach on the subject of healing,” most people in the congregation will say to themselves, I already know about healing. Well, people may think they already know all there is to know about healing, but when there’s a healing line, more than half the congregation will get in line for prayer! That tells me they don’t know as much about healing as they think. Or they don’t know how to walk in the light of what they know. No matter how well we know a subject, if we don’t continue to practice or review what we have learned, we will forget some things. A person may have acquired spelling, math, or computer skills, but if he hasn’t used them in a while, when he does try to use them, he may discover that his skills are rusty. The same thing can happen in spiritual matters. You see, many Christians know about the subject of healing, but they’re not as proficient in healing as they could be—simply because they haven’t practiced what they know. In other words, they don’t continually study the subject and act on what they’ve learned. There are certain subjects we need to continually brush up on, and healing is one of them. The Bible teaches that there are many ways to receive healing: through the healing anointing; through a manifestation of the gifts of the Spirit, through the laying on of hands; through the Name of Jesus; and so forth. In this article, I want to study the life and power that reside in God’s Word. God’s Word is the never-failing remedy for whatever you need. No matter the sickness or disease, God’s Word has the answer for you! 22 For they [God’s words] are life unto those that find them, and HEALTH TO ALL THEIR FLESH. According to this passage of Scripture, what is health to all man’s flesh? God’s words are! Does this passage say, “Attend to My words, for they are health unto your spirit”? No! It says God’s Word is health to your flesh! You see, God is interested in our flesh. He wants His Spirit dwelling in a body that is healthy and whole, because He wants what is on the inside (His Spirit) to be demonstrated or manifested on the outside. In John 6:63, Jesus tells us that God’s Word is full of life—of healing, health, and happiness. It’s full of whatever you need at any given moment. God’s Word is where your answer is! 63 . . . the words that I [Jesus] speak unto you, they are spirit, and they are life. Yes, there are powerful moves of God’s Spirit and awesome physical manifestations of God’s power. But God’s power is also in His Word! Not only does His Word contain power; it contains life. You see, the Word of God is like medicine to our body. What happens when a person takes medicine? The medicine works to heal his body! We need to learn how to take the medicine of the Word of God and let it heal our body. The word “attend” in verse 20 means to give one’s undivided attention. This verse could be better understood if we read it like this: “Give your undivided attention to the words of God.” When someone says, “I want your undivided attention,” we know that means we’re not supposed to be thinking about anything else, looking at anything else, or doing anything else, but we’re supposed to focus directly on what that person is saying to us. And that is exactly what God wants us to do! He wants us to shut out everything around us, and, without any interruptions, give our undivided attention to His Word! That is what the phrase “attend to My words” in Proverbs 4:20 tells us. The second part of Proverbs 4:20 states, “Incline your ear to My sayings.” The word “incline” simply means to listen. Again, we could better understand verse 20 if we read it this way: “Listen with your ears to what I am saying.” God is telling us to open up our ears to what He is saying. It’s interesting to note that a person can have perfect hearing, but if he decides he doesn’t want to listen to someone who’s talking, he can tune him or her out, so to speak. In other words, the sound of someone talking goes in his ears, but he doesn’t really hear what that person is saying. We shouldn’t tune out God’s Word. We need to open up our ears. In opening up our ears to His Word, we are closing our ears to everything that’s contrary to what God says. So many times, we listen to what God says, but we also listen to what So-and-so says. We begin listening to this person or that person, but it’s only what God says that matters! It’s important for us to open our ears to the Word of God and turn off everything else so that our undivided attention is on what God has to say. That is where the victory is. You see, when you close your ears to outside things and keep your ears open to the Word of God, you are closing your ears to fear, doubt, and unbelief. What we hear is very important, because what we hear and pay attention to is what we will respond to. Proverbs 4:21 says, “Let them [God’s words] not depart from thine eyes; keep them in the midst of thine heart.” The phrase “Do not let them depart from your eyes” doesn’t mean we are supposed to walk around with our Bible hanging down from our forehead over our eyes! If we did walk around like that, we would bump into things, and we would never get anything accomplished! But that phrase does mean that when we are facing the circumstances of life—sickness, disease, financial lack, and so forth—we are to look to the Word of God instead of looking at the circumstances. If you’ve been attacked with sickness, you can probably look at your body and see that an illness is present, or you can feel the presence of that condition. But you aren’t to respond to that! Instead, look to the Word of God, which says, “You are healed and made whole” (Isa. 53:5; I Peter 2:24), and respond to what God’s Word says! Many people go to God and respond to His Word in the bad times, but in the good times, they don’t respond to God. They don’t give God’s Word the same attention they did when they were going through a test or trial. Then, when they find themselves in bad times again, they often falter. We need to respond to God’s Word in the bad times and in the good times! In His Word, God tells us what to do and how to act in every situation and circumstance of everyday life. He also tells us how to receive healing and how to stay healed. God’s Word instructs us on how to get out of our difficulties and troubles and how to stay delivered! We need to respond to God’s Word no matter what kind of circumstances we may be facing. Unfortunately, many people don’t want to respond to God’s Word if it means they have to live a godly life-style. Knowing they have to live a certain way puts responsibility on them! God has given us His Word, but we have to act on it! If we want to live a successful Christian life, we have a part to play. If the person doesn’t follow the instructions, he could get into trouble by taking too much or not enough of the medicine—or by taking the dosages too often or not often enough. When someone is taking medicine, he must be very conscientious to take it according to the doctor’s prescription, because the medicine will not be effective, or it won’t be as effective, if it is not taken properly—according to instructions. We must do the same thing with the “prescription” that God has written for us. It is very simple, and it is found in Proverbs 4:20 and 21. In this passage, we find four steps to taking the medicine of God’s Word. Attend, or give attention, to God’s Word. 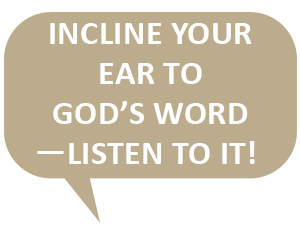 Incline your ear to God’s Word—listen to it! Don’t let God’s Word depart from before your eyes. In other words, focus your eyes on what God’s Word says about your situation, not on what the circumstances say. Instead of believing a negative report, believe the report of God’s Word, which says you are healed and whole. Regarding step number three—keeping your eyes focused on the Word rather than on the bad report—I don’t want anyone to misunderstand me on the issue. I thank God for good doctors; I believe they help as much as they can. I have nothing against doctors, and I don’t have any problem with someone who goes to see one! There is absolutely nothing wrong with Christians going to see a doctor. Going to a doctor does not take away from your faith as long as you keep the Word as your focus—keep it uppermost in your heart and mind. You must simply keep God’s report as your focus, and believe what His Word has to say. There is power, health, and life in the Word of God! We must hide God’s Word in our heart (Ps. 119:11) so that when we face a test or trial, we will take the Word of God and walk on through to victory. The Word has come to heal us and to set us free. Psalm 107:20 says, “He [God] sent his word, and healed them, and delivered them from their destruction.” Healing belongs to us! We must know what the Word of God says for ourselves in order to appropriate it in our lives. And no matter how much we know about God’s Word, we must never forget the basics. You see, no matter how much we grow spiritually, we will never outgrow the basics of God’s Word. And we must continually review what we know on the subject of healing if we want to stay sharp, so to speak, and successfully achieve our objective of walking in divine health. 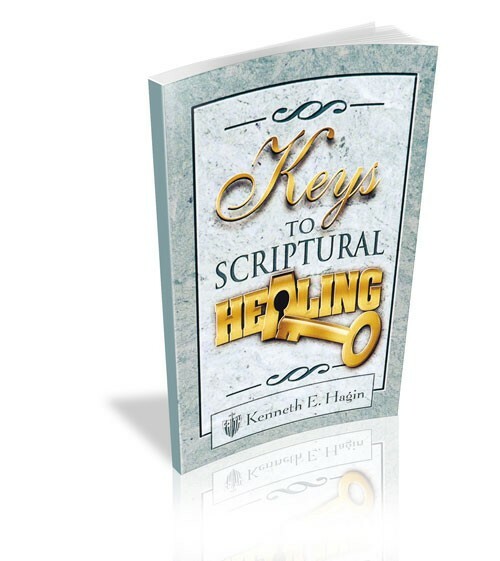 Keys to Scriptural Healing by Kenneth E. Hagin explains how God's Word supplies the key that unlocks the blessings of divine healing.